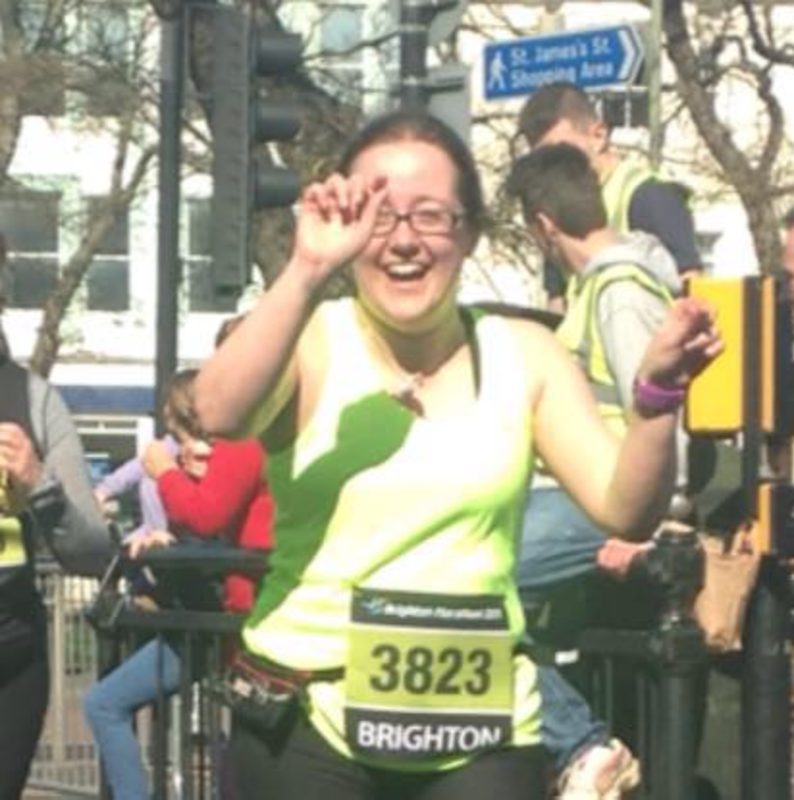 I signed up for the Brighton Marathon in July last year. I didn’t tell many people about it until after the Great North Run, in September. I trained through the snow and drizzle of a winter in the west of Scotland (with varying levels of consistency). I somehow ended up doing most of my long runs during the week, from work to home in a very much Going The Pretty Way; I realised that this had perhaps been a mistake when I discovered at 10pm on a Wednesday that I have great difficulty stomaching real food after anything beyond about 14 miles. By the time I got to Holy Week (and taper / cross training via altar stripping and thuribleing), I was questioning my own sanity. On Friday, I packed and panicked and dithered. I almost forgot my gels. I did forget my sunscreen, which is why I am now sporting an impressive Garmin sunburn line on my left wrist. I slept badly, alternating between worrying that I’d sleep through the alarm and having confusing dreams about running five different marathons that weren’t Brighton. My goal was to finish (and get an automatic PB). My second goal was sub-6:00. My only-if-unicorns-exist goal was sub-5:30, which would happen only if I didn’t hit the wall and my legs became powered by jet fuel. We arrived in Brighton on Saturday afternoon, caffeinated, to blue sky, sunshine, and hugs from Pam, who was to provide the Local Knowledge section of my support crew. If you are doing your first marathon, I highly recommend choosing a city that has a friend in it. Not only are they able to source plates of the city’s finest carbohydrates, they can also be emotionally blackmailed into provision of cheerleading services. Of course, it turns out that I have many excellent (and insane) friends. Since starting to tell people in September that for my birthday I was going to run a marathon, I had amassed quite the cheering squad and with more to come. My morning began with a hug from Holly and an observation that I appeared to be shaking, and then a frantic hunt for an open shop that would sell me some sort of sanitary wear. At eight in the morning. On a Sunday. In England. Thank God for Tesco Metro. And because the queue for the Portaloos was going nowhere fast, thank God also for large trees and shamelessness. Finally, we all came upon a park with a lot of people lining up behind a start line. After a brief panic, we realised that they were the runners for the Brighton 10K. We agreed that we were a bit envious, but magnanimously cheered them on their way before splitting up to find baggage trucks and coffee and, in my case, the aforementioned large tree. As I was searching for the entrance into the start pens, my phone rang. Coralie! She had been travelling into Brighton for the day and hadn’t expected to make it to the start, but she was standing next to my corral. It was lovely to see a friendly face before I got going. And then we did get going and I was sent on my way by a high-five from Jo Pavey. I love Jo Pavey. The Paula Radcliffes and Mo Farahs of this world are fabulous and inspirational and I’ll never shut up about the year I high-fived Mo Farah in the Great North Run, but people like Jo make people like me believe that we can do it too. The first mile loops around Preston Park, up what on the elevation profile looks like the worst hill of the course. I was running next to a rhino, a Peppa Pig, and a guy called Dave who was wearing an enormous telephone and raising money for the Samaritans, so there was plenty of crowd support for the little knot near me. I liked that hill, which kept me from going off too fast, and as we turned downhill just before the first mile marker I was chanting to myself to not overcook the downhills. I still had twenty five miles to go, and that’s quite a lot of miles. The next few miles ticked away steadily. It was nice to run past the Pavilion, which felt like a landmark. Coralie saw me there and screamed, but apparently I had game face on and didn’t notice her at all. (Sorry.) A bit past The Level, there is a tiny loop less than a quarter of a mile long that goes up a short sharp hill and past about five apartment buildings. I realised halfway up the hill that I had gone past the 4 mile marker and that that meant I could have my first gel. A very short way after that, there is a longer hill on the way up into Kemp Town. I was happy and enjoying the sunshine and feeling strong, and the crowds were out in force. And then, out of nowhere, Holly and George were on the street and cheering. I hadn’t expected to see them until half marathon point, so it was amazing to see them there. “WHAT ARE YOU GUYS DOING HERE? !” I shouted. “GO RUN!” George yelled at me. And less than half a mile later, there was Pam, who got a sweaty hug before I dashed off down to the seafront. The course after that point cuts off the pier but then follows the seafront for a long way, all the way down to Ovingdean, as an out-and-back. 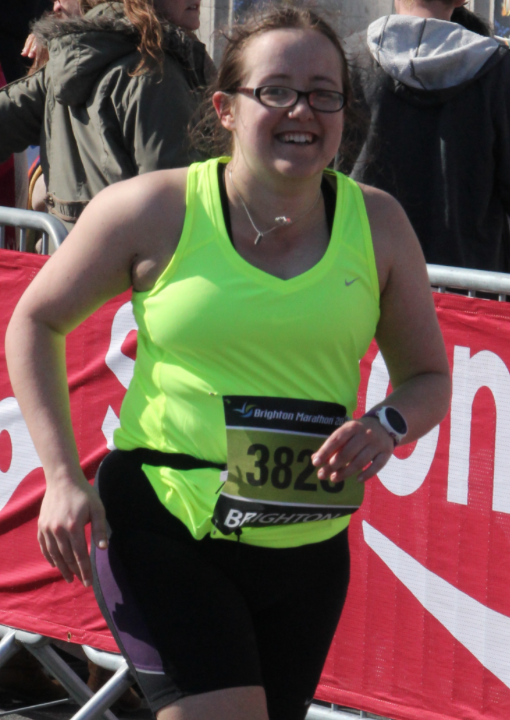 I liked the out-and-back aspect of it at that stage; I was on a nice gradual slope up, and I enjoyed watching the faster runners and realising that it would be mostly downhill on the way back into the centre of Brighton. It was warm and there was a gorgeous sea breeze and the smell of salt in my nose. I was having a ball. My energy levels were good. My legs felt good. The only thing that was bothering me, actually, was an awareness that my underarms were beginning to get quite sore. There was a St John Ambulance cadet at the 6 mile marker handing out Vaseline, and I cut across the road to get to him. “Yes,” I said, and slathered it on. Sorted. Later, so I am told, a very small boy who borrowed George’s lap because his feet were sore would get very concerned that the cycling St John Ambulance paramedics were “cheating”. I had been taking on a couple of slurps of water at most of the water stations, but I was offered a bottle of Gatorade at that point. I hadn’t trained with it but I tend to handle sports drink fairly well if the flavour isn’t too strong, and I grabbed a lemon one. I had never had it before yesterday, but it is the most delicious thing in the world. It tasted like a lemon ice lolly. I decided then that that was what I wanted at the finish. I took a bottle of lemon Gatorade every time one was offered after that, and let me tell you, the thought of that ice lolly (which by the end I didn’t even want anymore) sustained me through a few dark patches in the later miles. There were no dark patches yet, though. There were some quiet spots down at the far reaches of the course, out on the coastal path between Brighton and Ovingdean, and I’d tucked my iPod into my belt in case I wanted music, but I found that I was quite happy just to be alone with my thoughts and the wind and the sound of a hundred running shoes slapping on the tarmac. The support picked up again as we ran into Brighton, between the 10 and 11 mile markers. A woman in a burgundy fleece was giving out free hugs and she was so enthusiastic that I took one, which was a good decision. An older gentleman was giving out Jelly Babies and I took one of those, too, which was a bad decision and I had to fight off nausea for half a mile until the next water station. Just after 12 miles, I heard a yell of, “GO ON, GIRL!” and I waved at Pam who had made it down from Kemp Town. 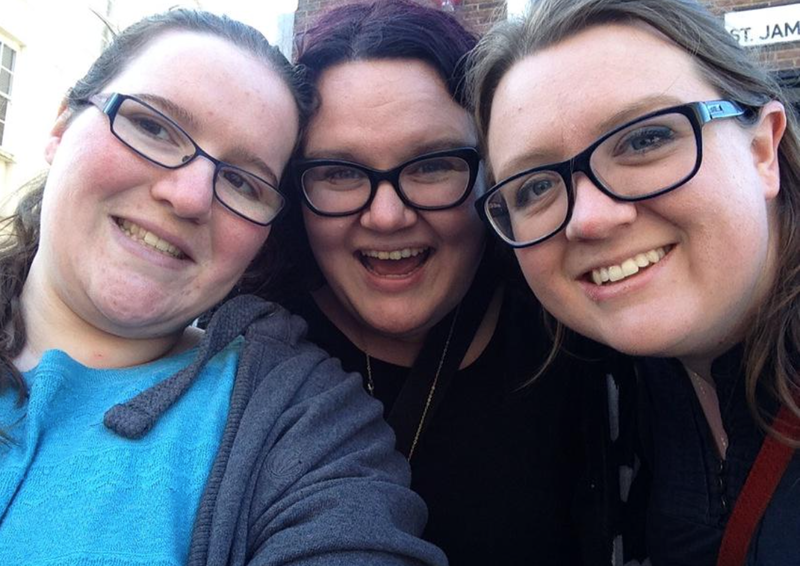 And very soon afterwards, near the hotel, were Holly and George and Coralie, screaming fit to wake the dead and having got hold of a couple of noisemakers. By now, the fast runners were coming back towards us and heading down towards the finish line. I had a long, long way to go before I was back on that side of the road. I got quite worried when my Garmin went for 13 miles and I couldn’t see a mile marker anywhere. It had been measuring a tenth to two tenths of a mile long ever since Preston Park, but usually I was close enough to spot the mile marker when it went. A few fuzzy-headed minutes later, I saw the Hilton arch for half marathon point and figured out that that was what we were getting instead of a 13 mile marker. I’d set up my Garmin so that I could just see the clock and get an alert and lap pace every time I went through a mile, but I flicked through the screens as I went under the arch. 2:41, which is twelve minutes quicker than my half marathon PB in any actual half marathon. And yet I was about to do it all over again. I knew I wouldn’t see my crew again until near the end, so I settled in for the long haul. We drifted along the seafront, still passing all the people who were racing through 24 and 25 miles and towards the finish. At some point we split so that they were on the seafront path proper while we were on the road, and then after the 14 mile marker the course took us up into Hove. Hove was out in force, although my main memory of this part was that it was an awful lot longer than it looked on the map. My pace had dropped by a fair bit by 16 miles, but I was determined that I was going to keep running until the 18 mile marker, which had been the length of my longest long run, before I thought about walking and just let’s never mind that all of my long runs had been punctuated by breaks for traffic lights… I was uninjured and my energy levels were still good, but my legs now felt very much like this qualified as a very long run indeed. I took on more water, more Gatorade, and orange slices where they were offered. I avoided the jelly babies like the plague after the nearly-puking incident by the Marina. I had been dutifully taking on gels every three miles, but I was struggling to stomach them now. I asked one of the spectators if I could have her glass of Prosecco instead. I cheered for Ellie the Elephant, running for Mind. As I finally glimpsed the corner that would take us back down to the seafront, I bleeped for 18 miles and I saw the mile marker a short way ahead and I thought that I really might walk. And then a pub started playing Chariots of Fire. You can’t walk in Chariots of Fire. Of course, you also can’t cry in the eighteenth mile of a marathon, that’s stupid, there’s still eight miles to go. But it was about then that I started to believe that I was really going to finish this thing. I got down to the seafront and to 19.26 miles (on my Garmin) before I walked. I walked to the 20 mile marker and then started running again. This is called the Road To Hell, out to the lifeboat station and back, and I was beginning to see why they call it that. In my head, I devised a run/walk strategy of a mile and a half running to a half mile walking that was intended to have my last walk finish at 25 miles. I forced another gel, and made a face but didn’t feel sick. “And then you run,” I told myself. The course support was very very thin that far out. I thought about my music, but decided that I would just get annoyed by it. I became that irritating person who cheers on the other runners. I ran for a bit with one man in sore silent solidarity, after a brief chat where we agreed that we were nearly done and we would finish and we might as well run through the pain. Just before the turn around, the course goes around the back of the lifeboat station. I was done with this bit. Oddly, not necessarily done with running so much as just very much done with this section of the course. The out-and-backs that make it such a fabulous spectator course, both for the spectators and for the seeing a lot of your crew, especially if you have as dedicated a crew as I did, are a bit of a double-edged sword for the actual running of them. I loved seeing people come back from Ovingdean and thinking that I’d be coming that way soon, but I hated seeing how far we had to go before we were done with the Road To Hell. At the 23 mile marker, there was a chip mat and a crew member reading out everyone’s names. He pronounced my last name right on the first try. That was maybe more impressive than the fact that I had just run 23 miles. Also at the chip mat, the map on the Brighton Marathon app corrected itself from projected position to actual position. This put me back from 23.9 miles to 23 miles, accounted for by my walks but apparently putting my crew down in Brighton into a frenzy as they tried to work out whether I had been put in the back of an ambulance. That got me back onto the seafront, down by the beach huts and with lots of support out. I’ve said much the same thing to myself twice now at the 12 mile marker of the Great North Run, and I’ve never managed it. I was going to manage this one. I would never ever again get to do the last mile of my first marathon. Every time I looked like I was struggling, every time I caught someone’s eye, every time I was alone, someone shouted for me or a kid gave me a high five. “Great form, keep that up all the way to the finish!” someone yelled. “You’re still smiling; keep running happy, 3823!” shouted someone else. It worked well enough that I got my pace back up to 12:40 minutes for my twenty-sixth mile. Not fast. But, faster than I had been — relentless forward progress. I passed a young guy at the Panda Bridge at the end of Brighton Pier as my Garmin went for 26 miles, and I shouted some encouragement at him. “WAS THAT BEEP FOR 26 MILES?” he screamed at me. “Yes,” I said. “It might be a tiny bit out…” I called over my shoulder. “I DON’T CARE, WE’RE NEARLY DONE!” he screamed back. The finish line is at the end of a proper downhill, and I went for it. I had glanced at my watch, and saw that I was back on for sub-6:00. The crowds were still out in force, still cheering everyone home, hours and hours and hours after the elites had gone through. And then there were Stewart and Kathryn, and past them Holly, and George who had somehow acquired a windmill, and Coralie and Pam, all of them yelling. I crossed the line and my medal was put around my neck by the medal lady, and I burst into tears. It is very shiny. My squad found me, and we stood for a good while at the finish line and cheered the last hour of people over the line. And then they got me tea and clothes, and in the case of George allowed me to sit in her wheelchair so that I could get on my pants without falling over. And then we walked slowly home together in the sunshine. Afterwards, George told me that when they were waiting for me at half marathon point they had been watching the fast runners go through the 25 mile marker. A guy who had been going along at a good clip collapsed, and two other guys, also running fast, both probably on for PBs and proper fast times besides, stopped and got him back to his feet and ran him into the finish. That sums up the spirit of a marathon more than anything else I can write. The running community has a big heart, and room for fast legs and slow legs, and leaves no man or woman behind, and I am very proud to have been a little part of it this weekend. 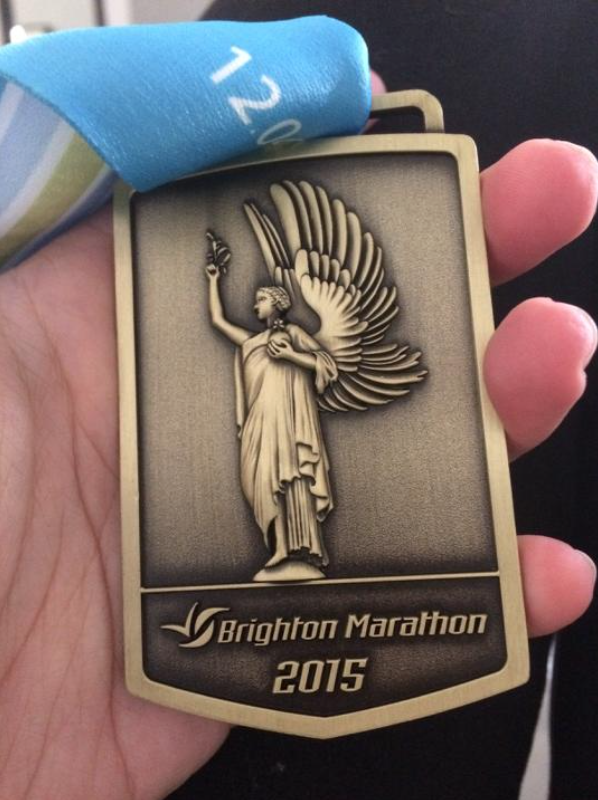 This entry was posted in Blog and tagged 26.2 miles is a really long way, brighton 2015, marathon, running. Bookmark the permalink. Thanks! And congratulations to you, too; I really enjoyed your race report, looks like I wasn’t too far behind you at the end. Amazing. Can’t even imagine what it must feel like to have that in you. But what, pray, are gels? Basically, quick release carbohydrates in concentrated gloopy form. You burn a lot of calories over 26.2 miles. They come in various flavours and I discovered several weeks ago when trying different flavours out that the peach ones taste like I imagine baby poo would. I may have cried. You are so fantastic!! A wonderful achievement and account, Beth. I’ll never run a marathon, but now I have an idea of what it feels like to do so. Thank you. I had a most excellent weekend. I unfortunately have one of those gloppy, possibly tastes of baby poo gels in the car somewhere, in case of emergency — good grief, I hope nothing is ever so dire. I really hate those things. But, I suspect if you get the right flavor, you only shudder instead of puke. Anyway, well done to you! 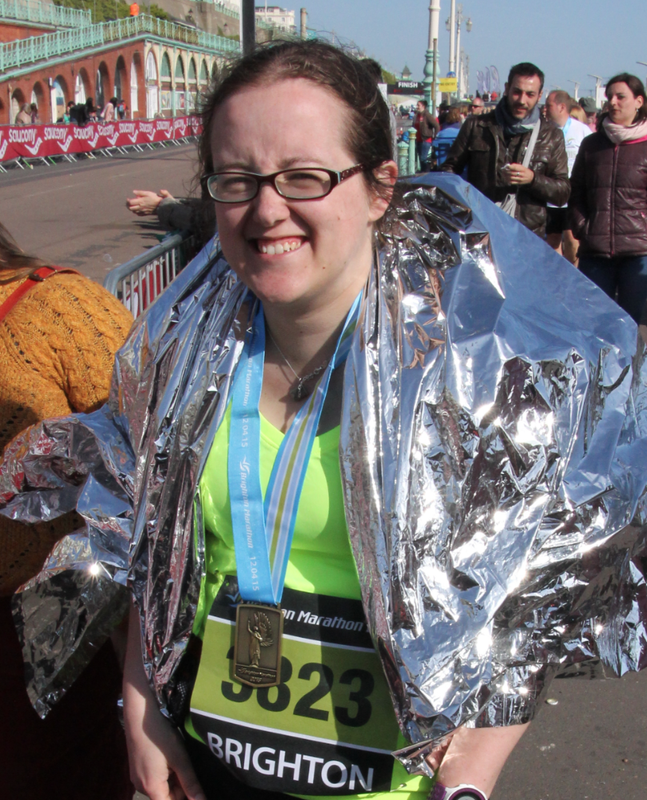 Don’t think I’ll ever run a marathon (why, oh WHY are all my crazed friends now doing this?) but you made it sound somewhat easy(ish). In the brand that I’ve been using, I have tried Blackcurrant, Apple, Citrus With Free Terrible Aftertaste, and Baby Poo (Peach). The apple and blackcurrant ones are all right, my stomach just packed up after a point. Not remotely easy, but SO much fun.